Spicy Potato Wedges, the best side dish that goes wonderfully well with any roast, burgers, meat sandwiches or wraps, or just on their own. Serve them with your choice of sauce, and you are in for a treat. No need to order a take-away, have your own feast at home, they are just amazing. Great choice for the Game Day, or just a nice meal. Who doesn’t like some potato wedges? Golden-brown, hot, delicious, oh heavens above! The are the perfect side for any roast, burger, and anything meat, and are way more delicious than anty take-away wedges. And a lot healthier too. Roasted in the oven with just a little bit of oil makes them nice and crispy on the outside, but fantastically tender on the inside. And that lovely spicy coating with paprika and a bit of chilli kick, a super winner! 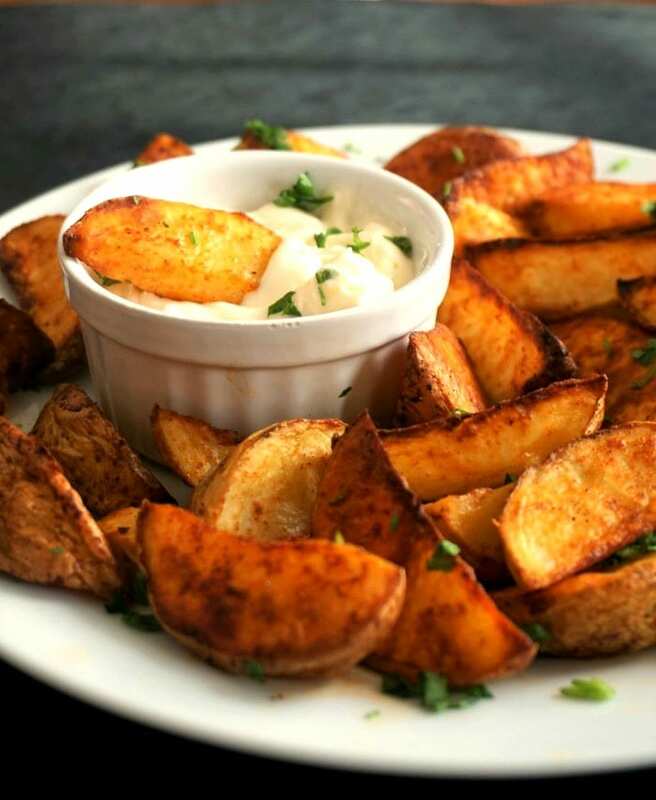 Together with my Crispy Roasted Garlic Parmesan Potatoes and the famous Garlic Smashed Potatoes, these wedges are my favourite side every single time. How do you make healthy potato wedges in the oven? A few tricks, and you get to enjoy some seriously yummy potato wedges every single time. I don’t bother peeling the potatoes, but I do give them a good rinse before cutting them. We want them completely dry before coating them with oil and spices. This will ensure they stay cripsy and they bake evenly. Shaking the wedges around will ensure they bake evenly on all sides. You can go for as much spiciness as you can handle, apart from the cayenne pepper, you can add any chilli powder you have, or crushed chillis. How do you season the spicy potato wedges? The best way to season the wedges is adding them to a re-sealable bag together with the oil and spices, and giving the bag a good shake. In this way, all the wedges are evenly coated, and not a single one had more seasoning than others. I use this techique with pretty much anything that needs seasoning, chicken pieces, potatoes, etc and it works really well. 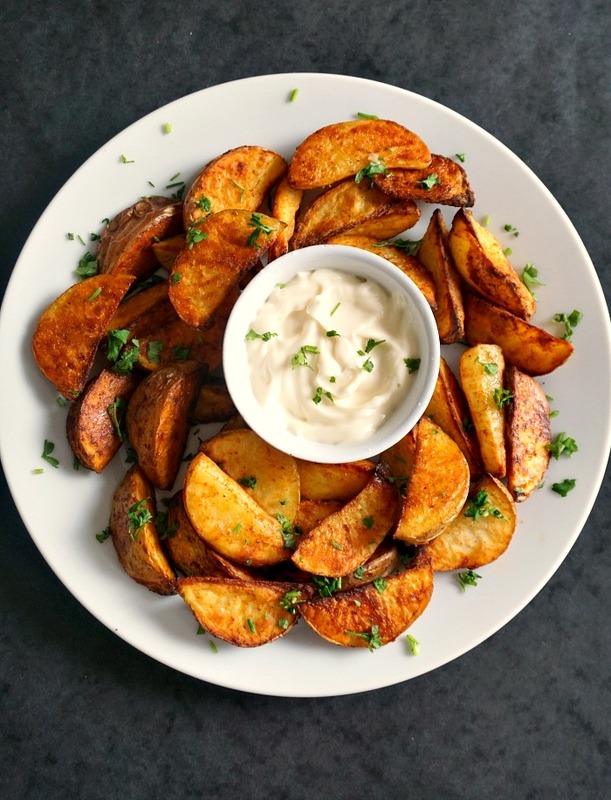 If you’ve tried my SPICY POTATO WEDGES or any other recipe on the blog then don’t forget to rate the recipe and let me know how you got on in the comments below, I love hearing from you! You can also FOLLOW ME on FACEBOOK, and PINTEREST to see more delicious food and what I’m getting up to. Homemade spicy potato wedges, the best side dish ever. They go fantastically well with any roast, meat sandwiches or wraps, burgers, or why not on their own. Serve them with your choice of sauce and you are in for a treat. Great choice for the Game Day. Wash the potatoes with cold water, pat them dry with kitchen towel, then cut them into wedges. You can peel the skin off, if you wish, but I prefer it on. Place the wedges in a re-sealable plastic bag together with all the other ingredients, except for parsley. Seal the bag and give it a good shake, so that they wedges get coated nicely. Place the wedges onto a roasting tray and roast for 50 minutes until crisp and golden-brown. 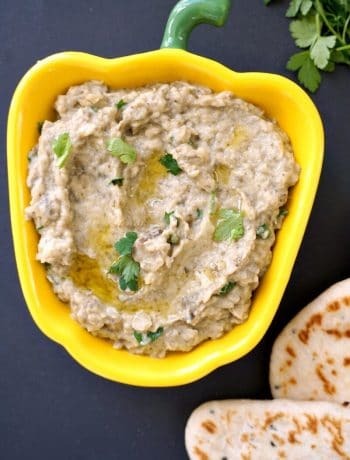 Potatoes are the BEST (especially with dip)! I love that you’ve made them spicy! I’ve got a bag of potatoes just waiting for this! My mom made these when I was a kid. I have loved them ever since. Perfect as a side to so many things. Great for breakfast and brunch too. The perfect way to cook the humble potato. Wow – you got some amazing color on these wedges! I struggle to make mine as pretty. Will absolutely need to try it your way…. as well as the spicy seasoning! Gimme all the potatoes!!! I love this recipe and the fact that it’s spicy is a huge plus for me as I just LOVE all things with a quick! The photos are gorgeous and making me hungry! It has been way too long since I’ve made these last! This is how I want to spend my weekend, with a plate of spicy potato wedges and chicken wings, yum! 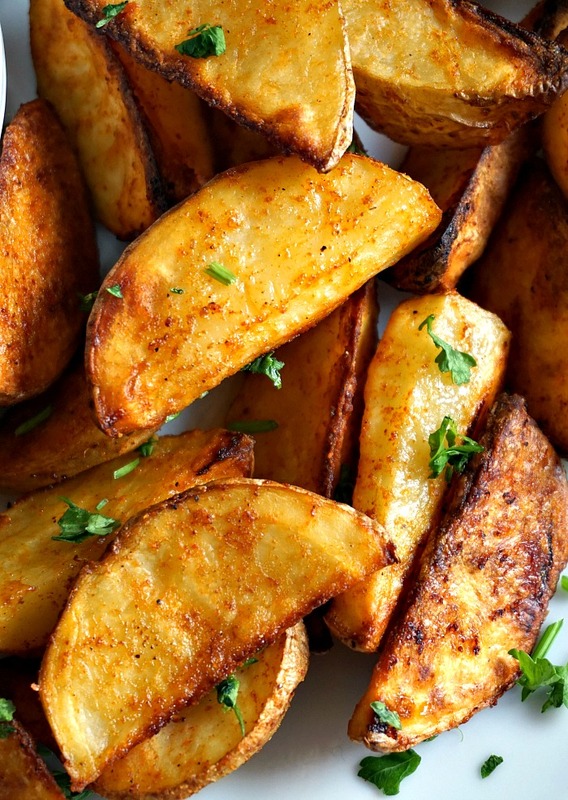 These potato wedges sound great, I love a spicy touch to them! 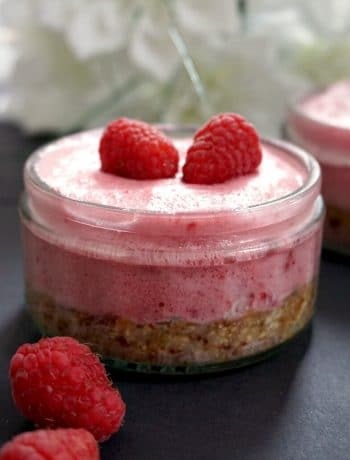 Looks like I need to make these soon! Crispy potatoes are one of my favorite side dishes! These are definitely going on my “must make” list!! Your potato wedges look perfect. I love how they look so beautifully browned and the do look spicy. YUM! we love spicy. Will try your method. We eat potatoes often here, they make a great side. I think my oldest would enjoy these, he likes spicy things. Oh these are going to taste so good with chicken wings tonight! I love all the flavors and the spicy kick! My son loves spicy- daughters not so much so I’ll make a double batch to make everyone happy! Is there anything as good and homey as a potato? So versatile, yet best left simple. I love roasted root vegetables and potatoes are no exception. Love the spiciness you’ve added to this dish. Looks like a winner! This looks so sooo good. Roasted potato wedges are my favorite winter dinner. The simplicity and variety of spice blend combos you can use for preparing wedges are just amazing, right?! Pinning! You had me at spicy! Those little crispy bits along the edges look so good. I got to tell you that this is my favorite way to eat the potatoes and just looking at that gorgeous roast you have on yours, I am tempted to make them right away and enjoy. Such a great recipe! Oooohhhhh these look so good and I sooo wanna grab them right out of the screen. 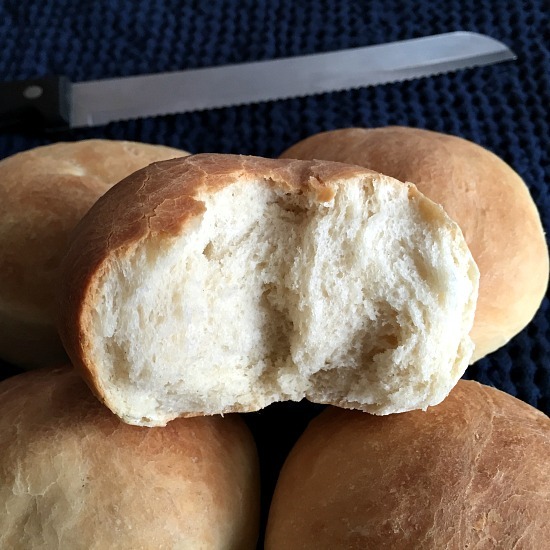 This is an easy recipe and will try soon. 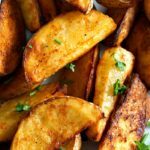 My children love homemade spicy potato wedges and would love the flavours you’ve got on these. Smoked paprika is just gorgeous on wedges I think and I find these days if I make plain wedges or unflavoured chips my children complain so I’m always looking for different ideas for flavourings. Thank you, Lisa! Glad you like the stew!